A clerestory is a window or set of windows located high in a wall near the eaves, or in a roof, that allows daylight into a building interior, and may be used for ventilation, light, and solar heat gain. The windows are typically operable windows and best oriented either south or north. A south-facing clerestory requires adequate roof overhang to prevent direct solar gain. 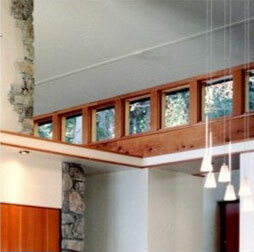 Operable windows in the clerestory also allow heat to escape from the house during the cooling season. North-facing clerestories may require a vertical wall section on the exterior west side to prevent heat gain from the setting summer sun. A clerestory is an element in passive building design and, in particular, passive solar design. In church architecture, a clerestory is a row windows in an upper story of a nave, particularly above the roof level of any aisles along the sides of the nave.